Despite a bloody sectar­ian strife, violence by Islamic State (ISIS) mili­tants and street protests demanding reforms, Baghdad is facing another chal­lenge stemming from deserving a UN honorary title. UNESCO accorded Baghdad the title of a City of Literature in De­cember 2015, joining more than 40 others worldwide on the UN’s Crea­tive Cities Network. The distinction pushed Baghdad t quickly opt for holding literary ac­tivities, such as poetry reciting fes­tivals, book expositions, painting and sculpture exhibitions to meet the minimum requirements of the United Nations Educational, Scien­tific and Cultural Organisation. UNESCO places tough condi­tions on new members joining its creative network. Besides having an outstanding literary heritage, a picked city should have vibrant contemporary scene and be a city where culture thrives. By joining the network, Baghdad committed to developing relation­ships and industries to strengthen literary culture for four years after the designation. Under UNESCO’s guidelines, Baghdad’s mayor should also expend $200,000 on literature activities during that pe­riod. “Activities started to kick off as of the beginning of March,” declared Basim Abdul Hamid Hamoudi, head of a state body overseeing the implementation of UNESCO’s des­ignation, called Baghdad, the City of Creative Literature Committee. “We are working together with many other state committees and NGOs (non-governmental organisa­tions) to organise literature and cul­tural activities in the coming four years, which is the period towards the implementation of UNESCO’s designation,” Hamoudi said. The plans, he explained, was to hold literary events that would not be costly, with committees work­ing in each cultural facility across the country to review its financial needs, worsened by years of war, instability and violence. Hamoudi emphasised that one of Baghdad’s literature and cultural landmarks, Mutanabbi Street, with its printing houses, libraries, book­shops and different literature and cultural activities, is enough to ful­fil UNESCO’s conditions. Iraqis in general, and residents of Baghdad in particular, write their history daily on the famed Mu­tanabbi Street. “Mutanabbi Street is the real creative Baghdad that spreads like a dream since the Ab­basid caliph al-Mansour decided to build a new capital city for his cali­phate,” Iraqi poet Yassir Omer said Still, Hamoudi insisted that there would be separate activities that would showcase Baghdad’s role in the world of literature. Poetry reciting festivals and painting and sculpture exhibition have been held in Baghdad recent­ly, which highlighter the city’s lead­ing cultural role in the region, said Hamoudi. He said about 200 Iraqi and Arab painters participated in the exposition. 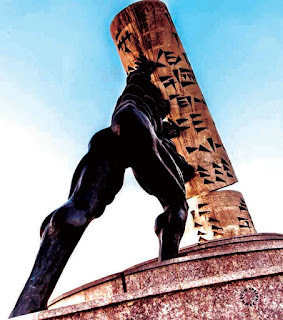 Iraqis in general, and residents of Baghdad in particular, write their history daily on the famed Mu­tanabbi Street. Insisting that Baghdad brought him the fame he enjoys, Rubaiee said: “Baghdad developed my way of thinking, my style of life and even my style of wardrobe.” Rejoicing in UNESCO’s decision, he said: “Baghdad was the capital city of the world, the ancient Meso­potamia.” Baghdad’s old quarters are wit­ness to that rich culture. One of the world’s oldest universities, built in 1233, still stands in the heart of the city on the Tigris, called Mustan­siriya. In every corner of the school, the past resonates. In his novel the Land of Black­ness, Abdul-Rahman Munif said he “drank Baghdad’s love with the milk” of his mother. “Even amid Baghdad’s charred ruins, the city’s destiny is still intertwined with ours, in an eternal bond of love and remembrance,” he wrote. Nermeen Mufti, based in Baghdad, has been covering Iraqi affairs for three decades.